Just as it would be difficult to judge the level of protection of "dustproof" products, the same applies to the term "waterproof" - it gives no indication the level of protection the product affords apart from the fact that it is protected against water ingress. 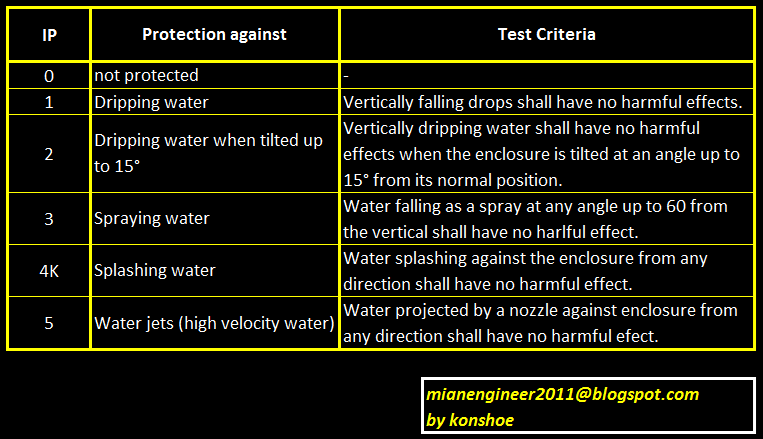 The 2nd code element of the IP rating helps shed some light on the level of protection, which is listed in the below table. The technical term usually associated to this code element is "protection against liquid ingress". A tabulated detail of IP Rating's 2nd code element. The interpretation of the numeric is similar to that of the 1st code element - an additional "K" shows that the level requires pressure, and that the letter "X" in the place of the 2nd code element does not mean that it is unprotected, merely untested. The range of protection is much larger than that for the 1st code element - it contains level 0 to 9K. Unlike the 1st code element, the higher protection level does not automatically equate a protection against a lower protection level. A product tested for IPX7 does not necessarily will pass the test for IPX4. 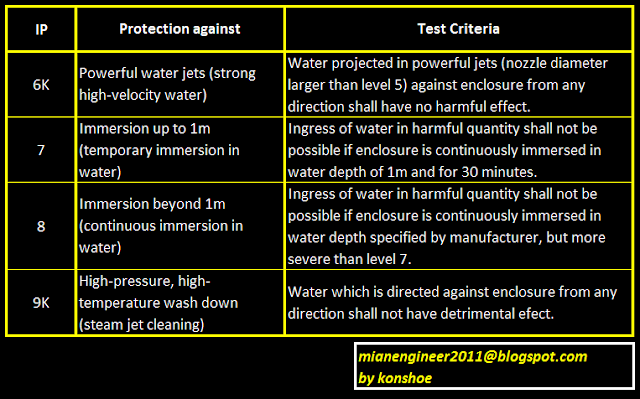 The reason behind this logic is due to the difference in the way water interact with the product during test. A separate article is planned for the elaboration on this. Just as it is the case for the 1st code element, different application cases call for different level of protection, all of which requires the judgment of the design engineer. 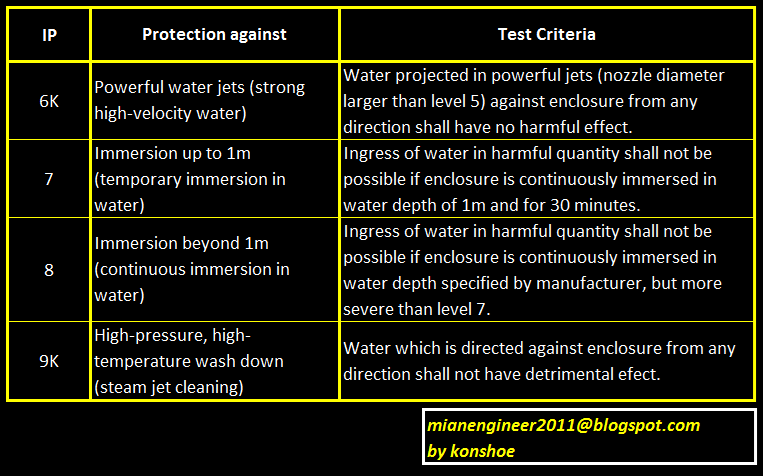 An electrical equipment under the possibility of being sprayed with water, such as being placed within a bathroom, may require at least IPX4 protection. IPX9K in particular is developed for road vehicles which require regular intensive cleaning, such as dump trucks and cement mixers. 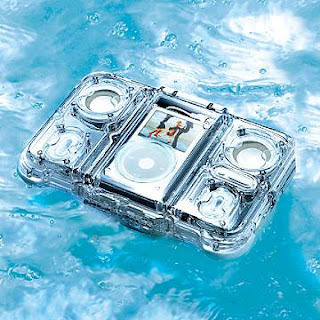 The boundary in which the protection is defined may not necessarily be the external compartment - the protection could be designed to only protect the electrical circuitry placed within so that they are isolated from water ingress entering the confinements of the product. 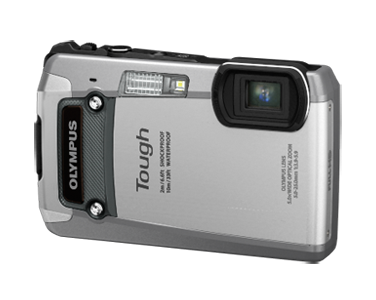 Tough TG-820 iHS - an Olympus camera which claims waterproofing, among other specifications. A glance through the specification will show that IP Rating was not used, and instead substituted with "waterproof 10m". 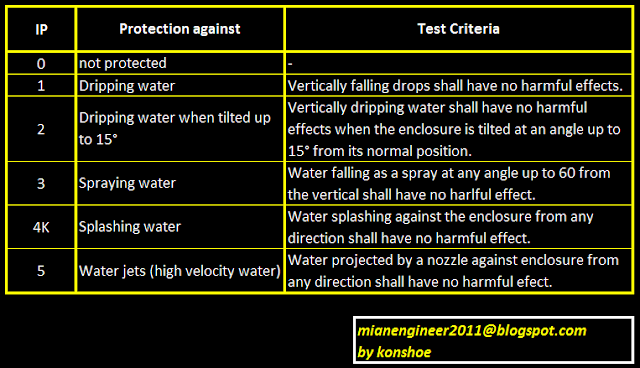 Most engineering equipment will not use this in their specification as it tells not the test environment of the waterproofing, such as water temperature, which may be vital to the equipment's performance (image taken from Olympus website).